Altitude is the perfect venue for your next group event. Altitude Austin is the largest trampoline park in Texas. When you come to Altitude Austin, you will notice how clean, bright and spacious our 40,000 sq. ft. venue is. Our park meets A.S.T.M. (American Society of Tests and Measures) standards to ensure that it is built with the industry's safest equipment. We host groups of 50 to 350 as well as full-facility reservations. We can accommodate you with private meeting rooms or open area picnic tables. Group rates depend on size of the group, day and time of each event. Group rates are well below retail, as we greatly appreciate you counting on us for your event. 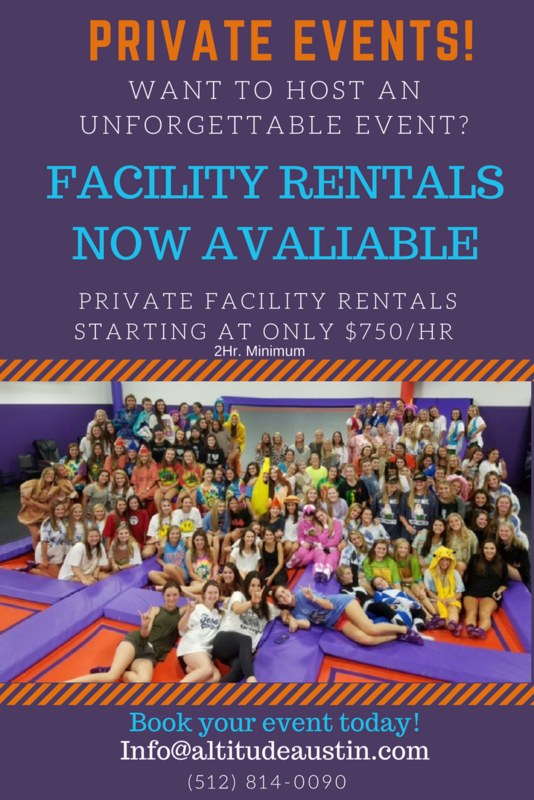 Please contact us for group pricing!